Dodge Off Road offers more steering upgrades for Ram trucks than you can find in any one place. From our patented one-sided braces to our wide variety of industry-leading linkages, to upgrades from other high quality manufacturers, we have it all right here. Select your category below for more information. 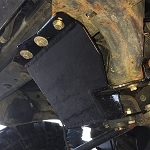 Dodge Off Road Steering Stabilizer Clamp 1.5"